On 12 March 2017, UNU-IAS, together with the University of Tokyo Integrated Research System for Sustainability Science (IR3S), organized an international symposium on Biodiversity and Sustainability: Linking People and Nature. Experts discussed how to build societies in harmony with nature, helping to achieve the Sustainable Development Goals (SDGs), as well as how to advance sustainability science. The event opened with remarks from UNU Rector David M. Malone, who noted the particular connection between traditional culture and biodiversity in Japan and highlighted the work of UNU-IAS Senior Visiting Professor Kazuhiko Takeuchi, who recently retired after serving as Senior Vice-Rector of UNU, among many other roles. In the first of three keynote speeches, Prof. Takeuchi stressed the need to strengthen links between people and nature, and highlighted efforts by IR3S, UNU-IAS, and others, such as the International Satoyama Initiative, Globally Important Agricultural Heritage Systems (GIAHS), and ecosystem-based disaster risk reduction. He introduced examples from Sri Lanka and Ghana, among others. The second keynote speech, by Gretchen C. Daily (Professor, Stanford University), called for a revolution in how people value and think about nature, inspired largely by Prof. Takeuchi’s ideas. She described her work with the Natural Capital Project, a broad-based effort to achieve better valuation of ecosystems than is provided by traditional methods such as GDP, and to find solutions for decision-makers for resilient societies, impact assessments, targeted investments and others. Mai Trọng Nhuận (Former President, Vietnam National University) delivered the third keynote speech, exploring challenges and opportunities for sustainability in Viet Nam. 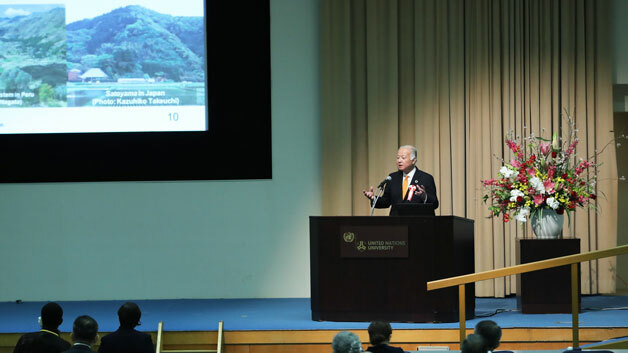 He explored the achievements and future prospects of sustainability science and sustainability education in the country, introducing many efforts based on the Japanese concept of the satoyama landscape, a major theme of Prof. Takeuchi’s work. In the panel discussion that followed, Tohru Nakashizuka (Program Director and Professor, Research Institute for Humanity and Nature; Professor, Graduate School of Life Sciences, Tohoku University) stressed the need for high-quality scientific studies to help decision-makers to create policy for sustainability and biodiversity conservation, highlighting the new Predicting and Assessing Natural Capital and Ecosystem Services (PANCES) project as a promising example. Fabrice Renaud (Head of Section, UNU Institute for Environment and Human Security) described the increasing prominence of ecosystems in policy related to climate change and disaster risk reduction, stressing the need to develop standards and guidelines for policymakers. Current UNU Senior Vice-Rector Taikan Oki provided an overview of the Millennium Development Goals (MDGs) and SDGs and their development through international processes over the past decades, emphasizing the need for further “sustainability development”. Fumiko Kasuga (Senior Fellow, National Institute for Environmental Studies; Visiting Professor, IR3S) explained the Future Earth project, an international platform to support work toward a sustainable world, its contributions to the SDGs process, and its activities in Japan. Thomas Elmqvist (Professor, Stockholm Resilience Center, Stockholm University; Visiting Professor, IR3S) provided insights into the concepts of sustainability and resilience, and introduced current work on understanding and creating resilient systems, particularly in urban areas. The panellists discussed the need for holistic approaches to complex problems such as sustainability and biodiversity conservation, spanning disciplines and national boundaries, noting that scientists face strong pressure to produce reliable data that can be used in policymaking. Panellists considered the valuation of ecosystems, debating the drawbacks of purely monetary valuation that ignores cultural and social values, and the influence that such quantitative valuation can have on policymaking. The symposium closed with brief remarks from Prof. Takeuchi emphasizing the need for people to rethink their values and behaviour in relation to nature, in order to protect natural capital and achieve sustainability and real well-being.